Weld said those issues have always been very important to him, and that "it would be ironic and counterproductive if in urging my allies in the Senate and the White House to press further for my appointment, I should become the instrument of harm to those very interests. But I did enjoy my summer vacation." Clinton accepted Weld's request "with great disappointment," saying in a statement, "He would have been a superb ambassador to Mexico." "At a time when we had been making strides towards a bipartisan foreign policy," Clinton said, "the treatment my nominee received reflected divisiveness that does not well serve the American people." Weld's decision came after Senate Majority Leader Trent Lott on Sunday closed off his last possible route to Mexico City -- an end run around Helms. 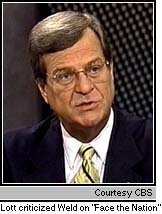 "This nominee should not be confirmed and will not be confirmed," Lott said on CBS' "Stakeout." A presidential phone call Saturday evening failed to save the Weld nomination. 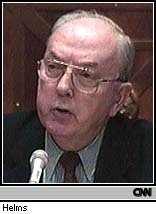 An aide to Lott said the senator got the call, was asked by Clinton if they could work out a way to move the nomination, and responded, "No." Weld said he bore no ill will toward Lott. "I think Trent was just carrying water for his chairman," Weld said. "I'm not blaming him; I'm blaming the chairman." For his part, Lott said after Weld's announcement, "Mr. Weld made the right decision. I hope the President will submit a nominee for America's ambassador to Mexico which the Senate can act on immediately. "The issue has always been Mexico and America's relationship with Mexico on immigration, trade, and stopping drugs." Weld, who resigned the Massachusetts governorship to fight for the ambassador job, had called Helms' refusal to grant him a hearing "a very un-American notion," and had vowed to fight a "war" over the nomination. But a Republican source in Boston who is close to the former governor said Weld decided over the weekend that his public campaign to force a confirmation vote was doomed to failure. And, the source said, several friends suggested Weld had made his point about the moderate-conservative split in the GOP but was putting his future within the party at risk if he continued to campaign for the ambassador's posting. "He's a smart guy," says one White House official, referring to Weld. "He looked at the situation and made up his mind over the weekend." Helms made it abundantly clear in a stormy committee meeting on Friday that he had no intention of granting a confirmation hearing to Weld. Helms had been forced to convene the meeting, but under Senate rules cannot be compelled to give Weld a formal hearing. Clinton might have tried to push the Weld nomination via a "recess appointment," a power given the president by the Constitution by which the president can appoint a special commission to fill vacancies while the Senate is in recess. The provision states, "The President shall have Power to fill up all Vacancies that may happen during the Recess of the Senate by granting Commissions which shall expire at the End of their next Session." However, Clinton aides feared such a move would have caused a furor in Congress, and could have derailed much of the president's fall legislative agenda. Weld said he had consulted with experts on how to navigate the Senate. "They said, 'You can't just have a hearing. First, you have to go on bended knee and kiss a lot of rings. Well, my mother and father taught me that I'm no better than anybody else, but also that I'm no worse. So I said, I wouldn't go on bended knee, and I wouldn't kiss anything. 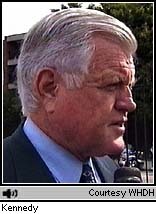 In this, I had the backing of President Bill Clinton, who felt that a fair hearing was the way to proceed." Sen. Arlen Specter (R-Pa.) said he was sorry Weld is withdrawing his nomination. "I believe this battle could have been won if he'd stayed with it," Specter said in a written statement. Other Republicans echoed Specter's dismay. "I am disappointed that Gov. William Weld did not receive a hearing before the Senate Foreign Relations Committee," reads a statement from Sen. Richard Lugar (R-Ind. ), who pushed hard for Weld. "The advice and consent procedure provided by our Constitution strongly suggests that many Senators will want to question a presidential nominee and that the nominee will have an opportunity to respond to public questions and criticism." GOP Sen. Paul Coverdell of Georgia said, however, that Weld was the wrong man for the job. 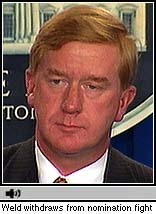 Weld's "central failing," he said in a statement, "was the lack of substantive experience in U.S.-Mexico relations." Said Coverdell, "I again urge President Clinton to nominate either a Foreign Service Officer or someone with substantial credentials in this arena." CNN's Wolf Blitzer and John King contributed to this report.